… in our election predictions? Now for the fun part. 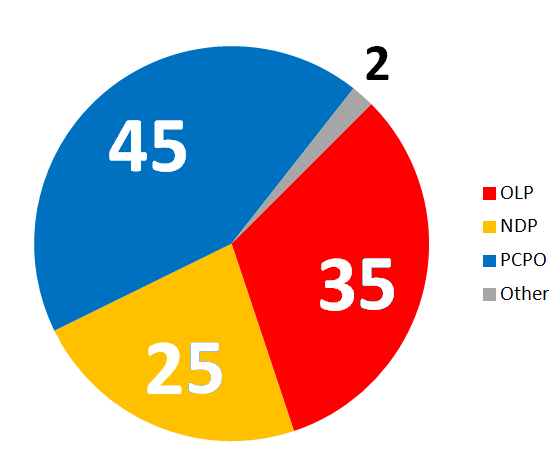 Based on past history of the pollsters I will predict LPO at between 36-38%, PCPO at 34-36% and the ONDP at 24-26% of the popular vote on election day. As he pointed out in a comment on the original post, he nailed it. And yes, he should open up a polling firm! Um. Not quite. I think this was more a case of wishful thinking… I wonder if he used some cephalopod ink in his tea leaves? Timmie Hudak and his merry band of tax fighters and gravy finders have managed to totally screw things up for the PCs. Yes, they have projected the wrong messages in the wrong way. And yes, they have alienated many in their own party… BUT… they will still win 30+ seats. Maybe as high as 35. However, the real threat to the Libs at this point is that lingering “Layton effect”. I think that some soft Grit supporters will switch to the Dippers once the ballot is in front of them. And this will lead to some NDP gains in some close ridings (i.e., Ottawa Centre). 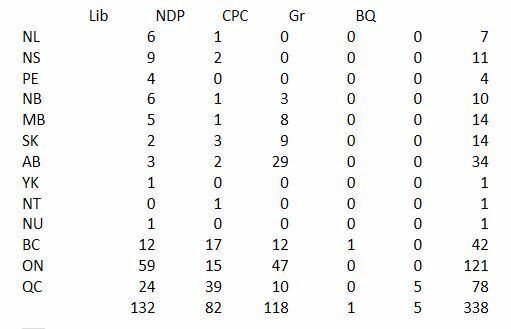 So I see the NDP in the 25-30 range while the Liberals will limp out with a minority government with 45-50 wins..
Soooo…. the winner is @RunnertheFirst… congrats Allan! I’ll buy you a pint the next time you’re in town (I think I already owe you one). I was cleaning out my backpack yesterday morning, when I came across all of my scribbled (and tear-stained – notes on how I went about calculating seat totals. I hadn’t yet compared where I went wrong provincially. 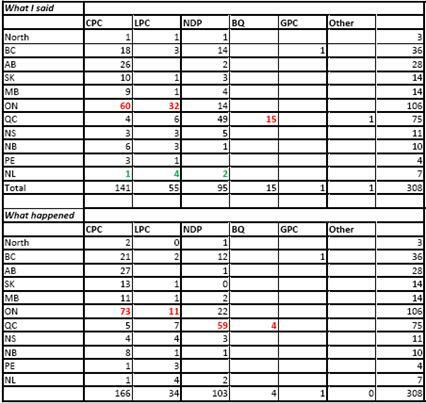 The pain of the May 2 results was still fresh so I hadn’t the gumption to take another look. Taking a big gulp, I looked at my notes. Here is what I figgered on May 1 and how things actually went down. So, I really wasn’t that far off. 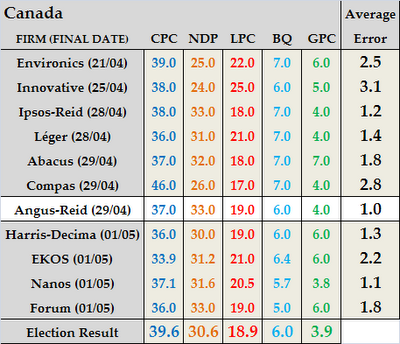 I did predict the NDP success in Québec, but underestimated it because I did not foresee the utter collapse of the Bloc. I also underestimated the degree to which the Liberals would fold in Ontario. The vote splitting among progressives was something I had anticipated, but not to this level. All in all, a dartboard might have served me just as well. Accurate polling is becoming more and more difficult as people trade in their land lines for mobiles and only the politically engaged bother to consent to being questioned by a polling firm. IMHO, Nanos is about the best out there with its rolling daily sample. And aggregators like ThreeHundredEight give some more context. But this election, like no other, showed that the only accurate poll out there is the one held on E-Day.